In NUG, the interdental papillae undergo necrosis beginning at the tips and extending toward the crest of the dental alveolar bone. As a result of the soft-tissue necrosis, the interdental gingival papillae exhibit a "punched out" blunted, crateriform area covered by a fibrinonecrotic membrane (Fig. 39). 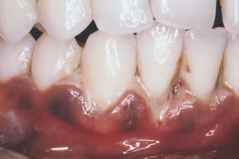 The gingiva are exquisitely sensitive and often exhibit spontaneous bleeding. A fetid odor accompanies the soft-tissue necrosis. There may be associated systemic symptoms of fever, malaise, and lymphadenopathy. Primary herpetic gingivostomatitis also presents with exquisitely sensitive gingiva, but there is neither necrosis nor the characteristic fetid oral odor (36). Primary herpes simplex also involves the nonkeratinized oral mucosa, while NUG is confined to the gingiva. FIGURE 39 Necrotizing ulcerative gingivitis. This HIV-positive adult male presented with multiple, punched-out necrotic lesions of the interdental papillae. The gingivae were exquisitely painful. A fetid odor accompanied the necrotic lesions. On the third tooth from the lower left, the fusospirochetal infection has extended from the gingival mucosa into the periodontal ligament (necrotizing ulcerative periodontitis) Source: Courtesy of Department of Periodontics, School of Dentistry, University of Missouri, Kansas City, Missouri.